This was the 2nd time we held the ‘Sonar Ray Challenge’ laser fleet race. It was a real challenge as it was quite windy! The Hobie Cats joined in on the fun and went out for match racing. 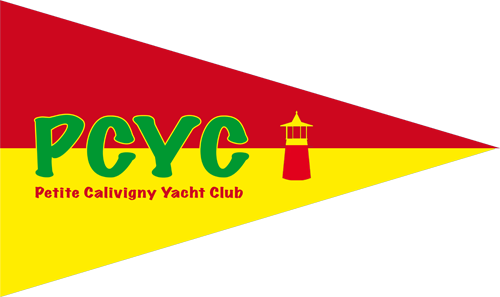 Many thanks to Carib Sushi for donating the prizes and Le Phare Bleu Marina, Grenada for being a great host! We had a great evening, with lots of fun and excellent food. The ‘Secret Santa’ was a lot of fun, thanks to Jeff for organizing and running it! Blue skies with light and steady winds. What else does one need for a perfect day of racing? The skies opened up to give us their blessing just when we were packing up for the day. Congratulations to Mike Staudt for the 1st, Tomas Guerrero for the 2nd and Danny Donelan for the 3rd place! Big thanks to our members Karen and Rick Feld, to open their lovely Villa Beachcliff in Lance aux Epines for our monthly lime! Great turn-out with a lot of new faces! Congratulations to John Elkins for the 1st, Mike Bingley & Divonne for the 2nd and Gill & John Douch for the 3rd place! We were a small group but as Shawn pointed out, this was the longest lime ever! Thanks to Timers Grenada for being a great host. Light winds and blue skies made this a great day. We had no capasizes to report! Congrats to Dave Royce for 1st place, Mike Staudt for 2nd place and Rene Froehlich for 3rd place. For this month lime we went to The Galley at Grenada Marine. This is where Jane and Dave started their business in Grenada, The Canvas Shop. With a sad eye we said ‘Farewell’ and looking forward to seeing you again! It was a great evening with great food, drinks, music and party! No doubt a fantastic event with 9 monohulls and 3 catamarans taking part in this great regatta! Unpredictable weather conditions kept racers away, so we changed the format for the day and just made it a fun day of sailing for those who turned up. Whether racing or just spending some time on the water, is was still a great day! Kids of all ages had a great time building sandcastles on Grand Anse beach yesterday. Lots of creative designs – good job everyone! Wow, we had quite an interesting day of racing on Sunday!! Plenty of wind. PLENTY of capsizes. Laser racers out on the hobies. Hobie racers out on the lasers! GREAT burgers. Action. Excitement. Overall, a GREAT day out on (and mostly “in”) the water!! 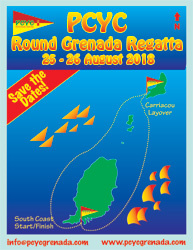 PCYC + Grenada Chocolate Festival = FUN!!! We had a fantastic day at the Dinghy Rally, Treasure Hunt & Games Day! Check out the video https://youtu.be/mFrq3ya9rfA. Special thanks to Mike Bingley, Lynn Fletcher, Jessica Holland and Silke Rothenberger for organizing the day’s activities. We had another great Lime @ another great place! Was also great to have some new friends join us, as well as our wonderful regulars. Morning clouds looked ominous, but the weather thankfully cooperated and gave us (mostly) a great day of racing! We had a fantastic crowd who came out last night to hear sailing legend Don Street talk about his 70+ years of adventures and misadventures at sea. Thanks to Don for sharing his great stories with us, and to all who attended. Our races are always at the mercy of the weather, and unfortunately it was too wet and wild out in the bay to ensure the safety and security of our racers and boats, so the day’s races were cancelled. We had a fabulous turnout and a great time at our first AWL of the new year. Thanks to everyone who came out, and to the Brewery for their warm hospitality and yummy brews.